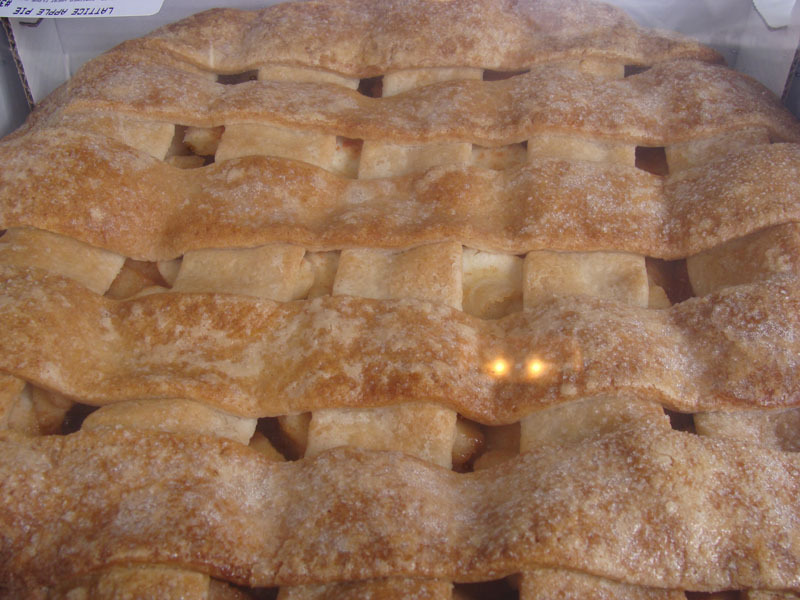 Every Thanksgiving I baked an apple pie for each employee. It started a few years back when I had 5 employees. Now that I have 30 employees that changes up the whole pie baking extravaganza. Now I go to Costco. 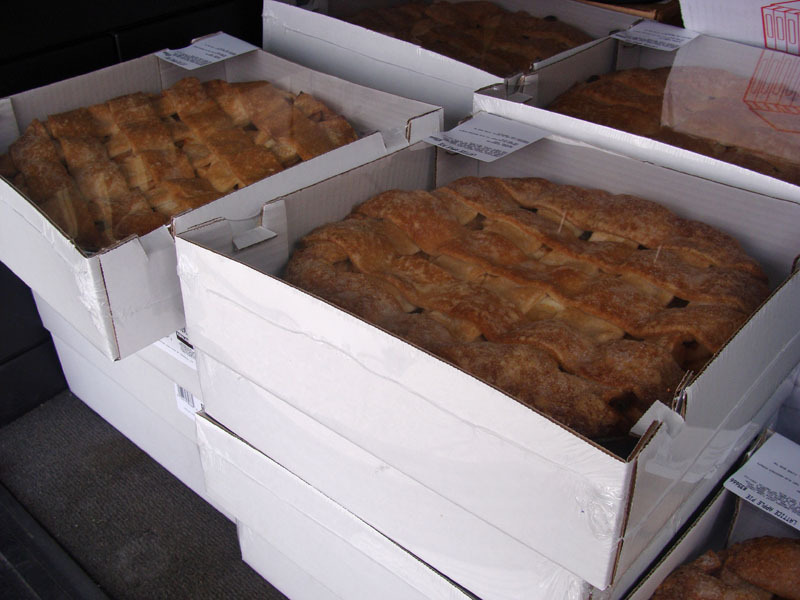 I get one of those big flat-bed carts and load it up with apple pies. Last year I got apple, pecan and pumpkin but that didn’t work out so well as there was too much controversy over not having enough of one kind and too much of another. Worse than kids. So this year it was to apple and only apple. I like doing it for two reasons: I like giving them something to enjoy with their families and it seems like a real farmy, cosy thing to do. I mean really, what is better than a nice apple pie. But I also enjoy watching people watch me buy all these pies. Each year I am always amazed at the reaction people have. This year was no different. As I pulled my giant empty cart behind me I made a little pit stop at the jewelry counter. Just to see. You never know. As I was standing there intently looking at diamonds and pearls a gentleman came up to me and said “That is a pretty big cart considering where you are looking”. I must have looked startled because he immediately apologized and said ” Sorry, it just looked so funny – you know tiny jewelry and that huge cart”. “ok funny guy – wait until you see that cart filled with pies if you want to see funny. Now jolted from my diamond trance, I left the jewelry counter and went to get the pies. I had about 25 pies loaded up when a friend came over to hi and check out my pies. As we are chatting, people are coming up to my cart – with my purse on it and my pies, and they start to take pies from my cart. Whoa there! I let the first few ones go, they are all the same pies. apple, apple and more apple. But then more people are taking my pies. When I was down to 10 pies I finally said “excuse me, this is my cart but look over there ” as I spread my arms and pointed to the ocunter ala Vanna White and said “all these pies are for sale”. The lady that looked a little miffed about not being able to take my pies she said ”Oh, I thought these were the fresh ones that they just brought out, you shouldn’t leave them on your cart like that”. Like what, like I was maybe going to buy them and this was the only way to transport them since I can’t carry 30 pies in my arms? So I said very nicely to her “These are the fresh ones - in fact they are still warm”. I could barely keep a straight face. You should have seen the look on her face, even with the botox I could see the the frown lines. Ha, ha mess with my pies will you? So, I reload and off I go to check out which is very crowded. I get into a line, me and my pies and we wait to pay. As I am fiddling with my phone I hear the mom behind me say to her son, who is about 10, “You can ask her why she has so many pies.” I look up and say directly to the little boy ”I LOVE PIES! Do you think I can eat all these pies for Thanksgiving?” ” No way” he says. “What if I get up really, really early and start eating them for breakfast, do you think I will finish by nighttime?” He pauses, he ponders, and then says, ” Nope, I don’t think you can do it”. ”Me either” I say. So I tell them about my employees and how everyone gets a pie. Then the man behind the mother days ” Well, that is really nice, I would much rather have a pie than a pink slip”! Yeah!! And to be honest, I have never seen my employees so happy to get their pie. It doesn’t cost much, the price of $8.99 is marked on each pie box. But it is the thought and sentiment. When jobs, money and credit are on the decline, it is important to remember that good tidings and well wishes are always free. These sentients may have lost some of their impact in these last few years when an IPOD or a cash bonus seemed to say it a whole lot louder. But in the end, a nice warm apple pie with friends and family on the holiday is really what it’s all about isn’t it? Happy pie eating to everyone!